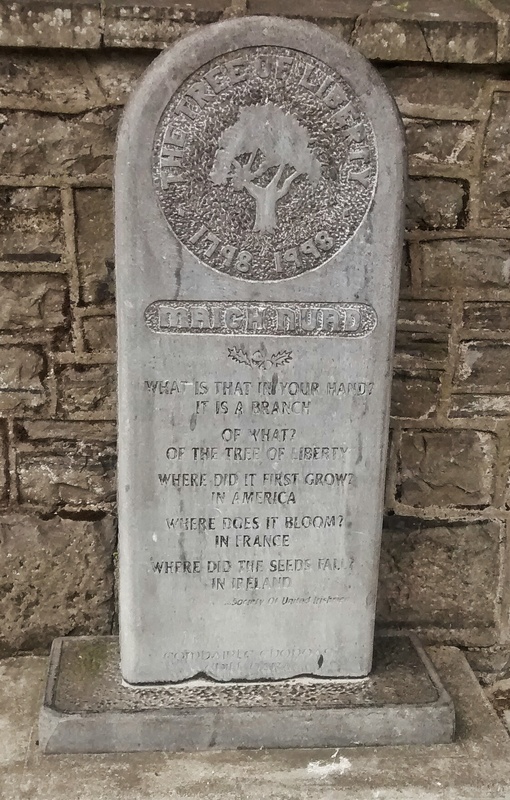 Monument to the 1798 Rebellion, Maynooth. Of the tree of liberty. Where did it first grow? Where did the seeds fall? The philosophical background of the French Revolution (up to 1799) was to be found in Montesquieu, Rousseau and Locke. Rousseau and Locke were already popular in Ireland, with the United Irishman Edward Fitzgerald educated along principles laid out by the two philosophers. William Drennan, who first formulated the idea of the United Irishmen, was a great admirer of Rousseau. In 1789, the month before the Bastille fell, a Whig Club was founded in Dublin, and in the following year in Belfast. These Whig Clubs held commemorations of the Fall of the Bastille in 1791, the same year Thomas Paine wrote his Rights of Man in answer to Edmund Burke’s Reflections on the Revolution in France, Wolfe Tone published his An argument on behalf of the Catholics of Ireland and the United Irishmen was founded (chronology, A concise history of Ireland (1909). There were further commemorations of Bastille Day in 1792, and in France that November Edward Fitzgerald renounced his title. France acted as inspiration for the revolt of 1798, both politically and philosophically, and (Wolfe Tone hoped) as a source of support. Ultimately it ushered in over half a century of civil insurrection in Ireland, Europe and around the world. A last Irish link – one of the seven prisoners in the Bastille the day it fell was Irish: Chevalier James F.X. Whyte, born in Dublin in 1730.